Lock in a great price for Hotel O3Zone – rated 8.3 by recent guests! The pool, the massage, the cleanness and the staff. The Deluxe Suite is amazing, luxury style inside and a huge terrace offering gorgeous views on Baile Tusnad and the surrounding mountains. Extraordinary experience. It was very relaxing, given the remote location it was like going back in time a little bit. The food is good, although I think is a little to expensive for that area. The best part was the spa. They have amazing people for spa and i had the best massage in my life . If you have you room on the front side of the hotel they have a great view . The staff was really nice and caring all the time. They let as check out a little later. Clean and quiet hotel. Pleasant staff. Children facilities in the restaurant. Friendly and helpfull staff, nice view from the room, tidy and clean. The pool was really relaxing and in general the facilities were better than expected, overall good value for money. The only thing that was very pleasant were the surroundings. Hotel O3Zone This rating is a reflection of how the property compares to the industry standard when it comes to price, facilities and services available. It's based on a self-evaluation by the property. Use this rating to help choose your stay! One of our top picks in Băile Tuşnad.Hotel O3Zone offers an indoor pool and a spa center, and is located in the center of the resort town of Băile Tuşnad. The on-site restaurant offers local and international dishes and various beverages are available at the 2 bars on the premises. An LCD TV and a mini bar are standard facilities in all rooms at the O3Zone Hotel. The private bathrooms come with free toiletries, bathrobes and a shower. Some units feature a spa bath and panoramic terrace. The reception desk is at your disposal 24 hours a day. Room service and packed lunches can be arranged on request. A gym, 2 saunas and various massage and wellness treatments are available at a surcharge. Ciucaş Lake can be reached within a 3-minute walk from the property. The slopes In Tusnad Ski Area are 0.6 mi away. The local train station is 1,650 feet from the O3Zone. This property also has one of the top-rated locations in Băile Tuşnad! Guests are happier about it compared to other properties in the area. When would you like to stay at Hotel O3Zone? 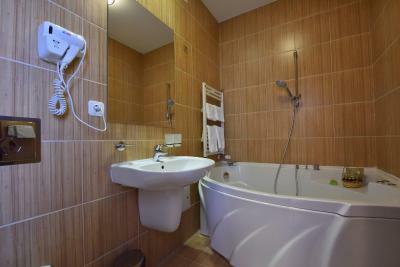 With an LCD TV, free Wi-Fi access and a private bathroom with shower. With a separate living room, an LCD TV, free Wi-Fi access and a private bathroom with shower. Top-floor suite with a terrace and a spa bath in the private bathroom. House Rules Hotel O3Zone takes special requests – add in the next step! One older child or adult is charged RON 93.38 per person per night in an extra bed. Hotel O3Zone accepts these cards and reserves the right to temporarily hold an amount prior to arrival. Please note the Spa is closed every Monday morning until 14:00. Buffet for supper was a bit poor for a 4 stars hotel. It was way too hot in the bedroom, and no posibility to stop the heat. Only by turning the ac on. A small chair in the balcony would help for smokers. Room was too small, wanted to watch some TV but it had only couple of channels all of them SD quality. I disn’t liked the staff, they weren’t very nice. The room was very small but clean. I didn’t liked the food which wasn’t at all as discribed in the offer. Bed sheets and towels are cleaned with a powerful chemical , skin sensitive or not look out! Overcrowded Spa, food was mediocre at most. The jacuzzi was cold ! The location, the hotel, the spa, the food.